Chicago played spoiler on Saturday as they beat Utah 1-0 in the Royals' inaugural home match. 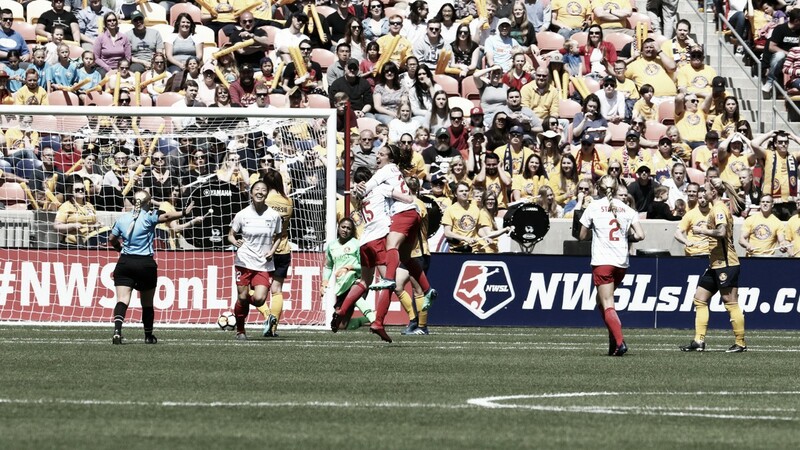 Utah Royals FC: Smith; Elby, Sauerbrunn, Corsie, O'Hara (Miramontez, min. 46); Bowen, Scott, LaBonta (Tymrak, min. 62); Jonsdottir, Matheson (Rodriguez, min. 77), Thorsnes. Chicago Red Stars: Naeher; Gilliland, Johnson, Naughton, Comeau; Stanton, Vasconcelos, Colaprico; Huerta, Mautz (Green, min. 80), Nagasato (McCaffrey, min. 90 + 1). SCORE: 0-1, min. 27, Colaprico. The Chicago Red Stars spoiled the Utah Royals’ historic day with a 1-0 win over the league’s newest team. Saturday marked the home opener for Utah with a crowd of over 19,000 there to see the Royals fight for a win. But a 27th minute goal by Red Stars midfielder Danielle Colaprico spoiled the day. A promising sight for Utah was the return of forward Amy Rodriguez who made her first NWSL appearance 363 days after tearing her ACL in the 2017 season opener. The match started out with a flubbed national anthem and technical difficulties which should have been an omen for how the game would go. Neither side appeared fully confident and neither the Royals nor the Red Stars found a rhythm that would last throughout the game. The lone goal came in the 27th minute of the first half. A poor header clearance from a Royals defender gifted the ball to Colaprico at the top of the box. The young midfielder took volley off of the bounce and sent it out of the reach of goalkeeper Abby Smith into the top right corner of goal. After the goal, Utah pushed forward to try and find an equalizer, but the squad traded a chance with Chicago before the end of the half and couldn’t find the back of the net. The second half saw both teams try and make a push. Chicago early in the half looked to add an insurance goal to the score line but couldn’t break through. However, an extra goal wasn’t needed. Utah’s only shot on goal came in the 56th minute after Diana Matheson sent the ball to Gunny Jonsdottir who had an opening for a shot to the right, but goalkeeper Alyssa Naeher stopped the shot to keep the shutout. 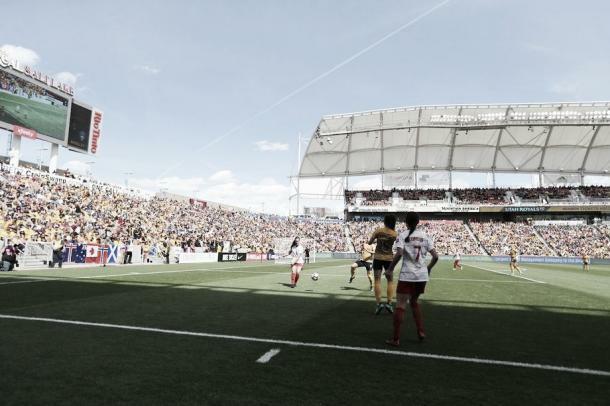 The highlight of the match for Utah was when Rodriguez entered the game in the 77th minute. The forward subbed on for Matheson and immediately made an impact taking a shot from outside the box that went just right of goal. Rodriguez’s return is much-needed for a Royals side that has only scored one goal in three matches and has not scored since the third minute of the first match continuing a 267-minute scoreless streak. While Chicago only got one goal past Smith, the team showed flashes of potential especially with the play of Colaprico and Japan-international Yugi Nagasato. While the forward was off the score sheet, she was responsible for a majority of the Red Stars’ chances. Chicago will have a hectic week coming up with two more games in the next seven days. They will take on the Houston Dash at home on Wednesday April 18 at 6:30 p.m. CT then face Sky Blue FC in Chicago Saturday April 21 at 7:00 p.m. CT. Both games will be streaming live on go90. Utah will search for their first win of the franchise when they travel to play the North Carolina Courage in Cary, NC April 21for the Lifetime Game of the Week at 3:30 p.m. ET.